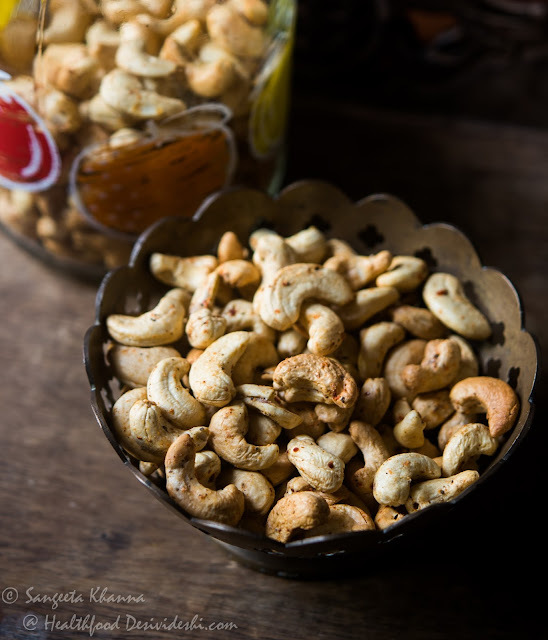 Roasted cashew is the most favourite snack in my home and I must admit it is quite addictive too. If the jar of roasted cashews is in sight you just end up going to it even if you are not feeling hungry. Else I believe both of us have a very good hunger and satiety discipline. I must add that even if roasted cashews seem to tempt us to eat more, we can’t really over eat as it makes you feel too full to skip your next meal if you have been close to a roasted cashew jar frequently in a day, that’s how real whole foods work. By the way I didn’t buy my air fryer to fry food or to roast nuts for that matter, it was because I wanted to dehydrate some ingredients for a product development assignment I was doing couple of years ago. I believe some foods taste better deep fried if they are meant to. Like we love our parathas and pakodas and I would never try and cook them without oil or ghee. I wouldn’t ever want to deprive myself from the goodness of good fats so fried and fatty foods will always be part of our diet, it is the good fats and right way of frying that matters more. Sometime I will write about how to deep fry foods in the best possible way so it is healthy and doesn’t waste the leftover oil. Air fryer comes handy for a few specific ingredients like potatoes and a few other vegetables, marinated chicken and fish (which have natural fat in them) and paneer etc apart from roasting nuts and even reheating foods so it should just be called hot air oven or something and not an air fryer. In fact I have been getting lot of requests about usage off air fryer after I shared a few pictures of food cooked in air fryer on Instagram, including these roasted cashew nuts. Rinse 200-250 gm nuts with plain water, drain excess water and transfer to a mixing bowl. Sprinkle the required seasoning. Mix well using a fork so the seasoning coats there nuts well. Transfer the seasoned nuts to the basket of air fryer and spread evenly. Insert these basket in thee base of the air fryer and lock it. Switch on the air fryer, set the temperature to 160 C and timer to 4 minutes (for 200-250 gm) and let the nuts roast on their own. Check the nuts after 4 minutes and transfer them to a dry plate if they are roasted enough for your liking, else push the air fryer basket back and let it brown a little more in its own heat. The air fryer remains quite hot for a few minutes so the nuts keep cooking for some more time to get you nicely browned nuts. Rinse the nuts before roasting. I used to do that even when I roasted nuts in microwave oven and in pan or other methods. It helps even roasting and the flavour of roasted nuts is much better. Add a little extra (about 20% more than you want) seasoning to the wet nuts after rinsing. The seasoning sticks to the nuts well but a little bit of seasoning comes off while roasting. If adding lime juice along with seasoning, it is better to let the nuts rest for 5 minutes before roasting. The resting time helps to absorb the extra moisture and flavour of lemon juice. Take care to not overload the basket with too much nuts. There should be enough small gaps to circulate hot air. If you dump too many nuts at once it may lead to a mix of raw nuts and over browned nuts in the end. Check the nuts after 2 minutes if you are roasting nuts in the air fryer for the first time. You may want to turn them with a fork for even roasting but it is not needed if the nuts are not overcrowded. Check the nuts after the air fryer turns off after the set time. Push the basked back along with the nuts ONLY if you want to brown the nuts a bit more. Note that the air fryer cavity remains hot for a few more minutes and the contents keep cooking even if it has turned off automatically. Rinse 200 GM cashews with plain water. Drain and transfer to a mixing bowl. Add 1 tbsp lime juice, 1 tsp red chili powder or more to taste, 1 tsp pepper powder, 1 tsp salt and toss well. Rest the seasoned cashew nuts for 5 minutes. Transfer the seasoned cashews to the air fryer basket, and bake at 160 C for 4 minutes. Leave the basket inside to brown on its own. Store the roasted cashew nuts in an airtight container. Serve as desired.